Yep. That does say 20 hours of driving! I know I mentioned it before, but I’m pretty sure we were crazy when we organised our trip. 20+ hours of driving? But it wouldn’t be the first time Tim and I have done a long trip – our trip right after our wedding was driving from my home in PA to my cousin in FL, which takes about 21 hours and when we went on our belated honeymoon in Autumn 2010 we drove to Austria. Still though, it is a lot! We decided to break it down into several days of driving, and even started our trip around 7PM on the Sunday right after Tim had worked a 12 hour day shift. No, I’m not kidding. He got home around 6, and we loaded up the car and headed to Ashford where we had booked into a single room at the Travelodge for the night. We have booked into these family rooms before and have always found them to be spacious, but this time we had a very small room and there was only about 6 inches between our double bed and Mom’s single! Fortunately, it was the only night we were all staying in one room. We showered that night and went to bed around midnight with the alarm set for 6AM. Our channel crossing had a check in time of 0720, and we were 20 minutes away. Checking into the Eurotunnel was easy and quick, and so was getting through French immigration……in fact, that nearly didn’t stamp my mom’s US passport (Tim and I travelled on UK passports)! Tim had to tell the I/O that we had an American in the car. He soon stamped her passport and we were on our way into the queue, where we sat for about 20 minutes before being directed onto the train. The train was a lot faster than I had thought it would be. Probably because the last time I went by rail, I was on the Eurostar and travelled between London and Paris. It hadn’t dawned on me that we would only be on the train to go through the tunnel under the channel and the trip only took about 30 minutes. The rest of the time was mostly loading and unloading! I also was surprised that you stayed sitting in your car and there were no snack bar facilities, but I also think that was du to my confusion on the length of the journey. Also, if they had to have coaches for passengers as well as the carriages for the cars it would have to be a VERY long train, or only take half the number of cars. 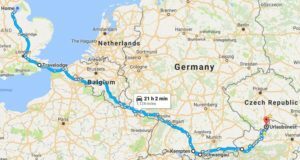 The rest of the drive on our first day was long and uneventful…..until we got diverted off the main road due to it being closed and could’t seem to find a way back (this clip wound up missing when I was doing the video, so I might do a separate one later) onto the autobahn! Our original hotel booked was called Schlossblick and was located in Schwangau. The check in deadline was a FIRM 2000. I kept watching the ETA on the sat nav (really, Google maps) and started to panic the closer the ETA got to to 8PM. I had read the reviews on Booking.com and saw that the owner does not give you any leeway, even if you ring ahead to tell her you will be late. As much as I was looking forward to having a balcony overlooking my favourite castle, we decided to cancel the booking around 4PM, as you could only cancel for free until 5. Fortunately, the booking.com app on my phone (I swear, I don’t work for them, I just really like their site!) helped me to find us a new hotel – this one with a 24 hour front desk. It was a SmartHotel, and we booked it about 2 hours before we arrived. Of course, this couldn’t go off without some kind of hitch. The receptionist spoke perfect English, and I can speak German, but we still semed to hit some kind of language barrier and it took me nearly a half an hour just to check in. First, he said I didn’t have a reservation, then he tried to put the three of us all in the same room (at the rate for two rooms!). Finally, we sorted it out and we had rooms located next door to each other. Then, when we got to the room, I discovered someone had left their clothing in the wardrobe! After taking the clothing back to the front desk, I returned to the room and crashed for the night. I don’t know what Mom did, but Tim and I did not stay up very long! In the morning, we ate breakfast at the hotel and got on the road to Schwangau and Neuschwanstein! Ultimately, we decided against doing the castle tours – The Maria bridge was closed, so no opportunity for those amazing photos, but you still got dropped off at the bridge. We remembered it being a 20 minute uphill walk to get to the castle, plus walking around the castle and up the stairs and decided with Mom’s knees to skip it, and instead we wandered around Schwangau for the morning and early afternoon. Tim and I wandered down to the Alpsee for some gorgeous photos of that “toothpaste green water” as Tim calls the Alpine water. We still had about 5 hours of driving to do, as once we were in Austria we still had to drive through most of the country to get to our first official stop! We encountered more road works, closed roads, and temporary roads. Fortunately, I was in contact with our landlord and was able to give him updates on when to expect us. We finally arrived around 7PM, long after the shops were shut for the night, so the landlords offered to feed us and we were treated to a smorgasbord accompanied by local beer. They spoke English, and I was slowly getting my German back….but Tim did much better than me! After a pleasant few hours with our landlords, we retreated back to our apartment where once again, we fell into bed. Map image at the top screenshot from Google.